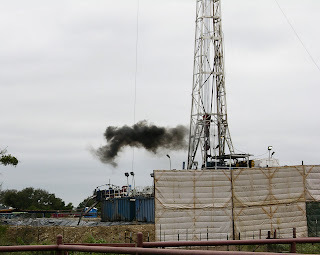 photo of Barnett shale well provided by Tim Ruggiero. Two weeks ago Range Resources announced that they would voluntarily disclose hydraulic fracturing chemicals used in drilling Marcellus Shale. At that time they provided a link to a "sample Marcellus Shale Completion Report" and seemed to imply that interested people would be able to find a list of all the fracturing chemicals they use somewhere on their website. While it's true that Range Resources has a link to the information on their home page, some people were hoping for a handy list of all the fracking chemicals used in Marcellus. At this point in time all that's posted is the initial press release, a description of casing design and one sample completion report. But that will change, says public affairs director, Matt Pitzarella. In a phone conversation this morning, Pitzarella reiterated Range Resources' commitment to increased transparency. "Beginning now, completion reports will have an addendum attached that lists the fracturing chemicals, as well as their amounts, used in drilling each well," Pitzarella said. These will be posted to the Company website as well. Where, exactly? Pitzarella wasn't sure. "We're re-vamping the website and hope to make it easier for people to find information," he said. Soon, meaning sometime within the next 4 weeks (but earlier, he hopes), there should be a button on the left column guiding people to "completion reports" or "hydraulic fracturing". He's still working out the details. After reminding me again that it was voluntary, Pitzarella said, "We're hoping that these reports give people the facts they need to make their own decisions. Some people are concerned that fracturing chemicals will get into their aquifers. So we want to make sure they know what we're using and the [very small] amounts." Vestal residents are concerned about having a metering station move into a residential area. One reason could be that once a metering station is in place it just makes sense to put another compressor station in too. At least that's what's happening a few miles west and across the county line. 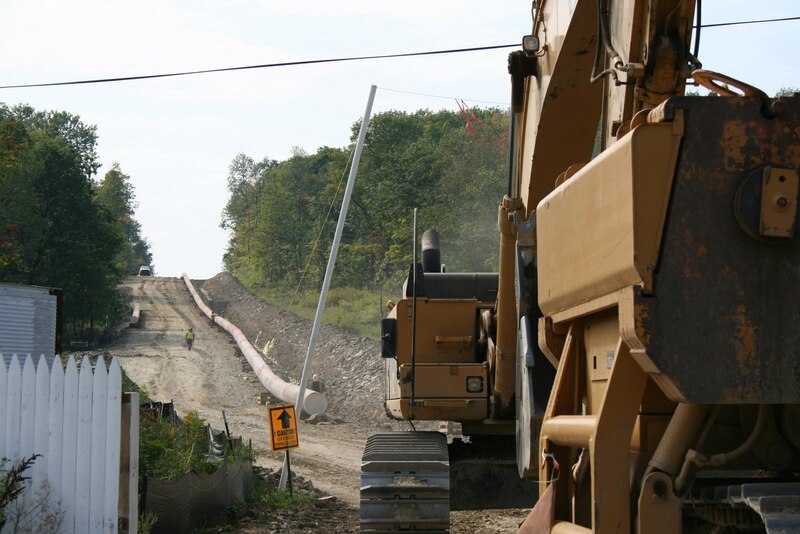 Central New York Oil and Gas Company (CNYOG) wants to put in a compressor station that will allow them to move gas in and out of their Stagecoach Storage field into the Millennium and Tennessee Gas Pipelines. The difference is that the CNYOG project falls under the purview of the Federal Energy Regulatory Commission (FERC). That means the proposed project gets an environmental review and well-publicized public meetings - something the Vestal proposal apparently lacks. 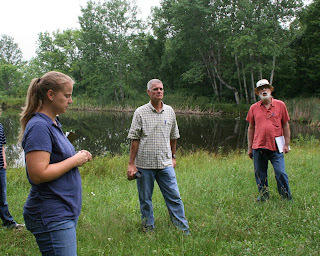 On Thursday, July 15 environmental engineers from FERC visited CNYOG's proposed compressor site for an environmental site review. Eight people, including unicipal officials from Owego, as well as representatives from Soil and Water Conservation District, NYS Ag and Markets and local residents, laced up their boots and joined them on the short hike to the site. It was more people than FERC environmental project manager Rich McGuire (the guy with the coffee cup) expected. Usually no one shows up for site reviews, he said. The current compressor is located on the Reeves Farm, between McLean Road and East Beecher Hill in Owego. “The problem,” said CNYOG representative Randy Parker “is that the current compressor just doesn’t have enough horsepower.” They plan to install an electric 13,400-horsepower centrifugal compressor uphill from the current compressor. A new compressor will allow them more flexibility in moving gas from the storage field to the pipelines. They’ll also need an electric substation at the site. Noise shouldn’t be an issue, Parker noted, because FERC regulations set that level at 55 decibels (dB). When asked about emissions, Parker explained that was the primary reason for building an electric-powered compressor. Except for fugitive emissions from the pipeline, there shouldn’t be any emissions, he said. McGuire asked, “Why here?” The most important reason, Parker explained, is that it's located close to the Millennium Pipeline. The construction won’t impact other land owners much, and the farmer who owns the land is agreeable to selling the 25 acres required for the access road and compressor. CNYOG looked at other areas but one was too close to the pipeline, and the other was too steep a slope. This site, while near the top of a hill, is fairy level. So far, Parker said, the only concerns from adjacent landowners are how the compressor construction will affect hunting, and the potential for storm water runoff. The facility itself will be unmanned, monitored electronically from a distance. In addition to monitors the station will have alarms and the capacity to automatically “blow-down” the walls in the event of a gas leak. Plans include retaining a wooded buffer between the compressor site and the landowners. “The current landowners are not opposed to the plans at all,” Parker said. 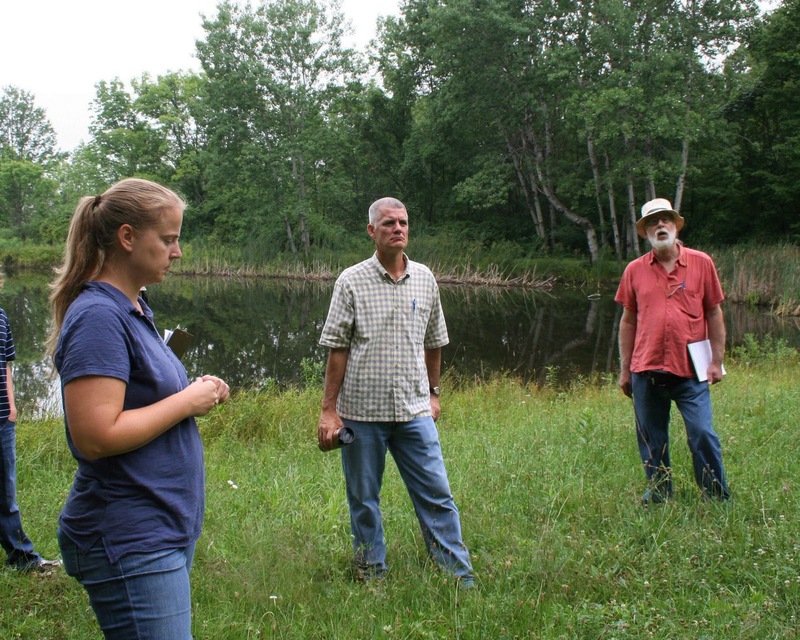 “In fact, they plan to incorporate the site into their hay-rides.” And neighboring landowners and hunters seem to appreciate the deer habitat the clearing will provide. Amy Gonzales, of AK Environmental, is working on the environmental assessment for the project as well. 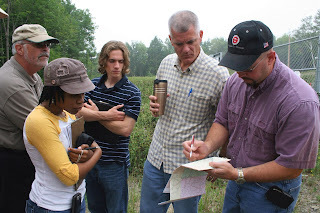 She addressed storm water runoff and wetland concerns. “We will be doing erosion and sediment control during construction,” she said. This includes such things as using a silt fence, hay bales, or erosion control blankets. She also explained that they will re-seed and mulch exposed soil and access roads. Read more about the FERC project here. Vestal, NY -- Despite the lack of notification, about 60 residents crammed into the Vestal Town Hall last night for a Zoning Board of Appeals meeting. On the agenda: whether the town should allow Inflection Energy LLC to construct a natural gas metering station that would measure and depressurize gas before connecting with NYSEG pipelines. Construction of the station would require a "use variance" from the current zoning laws because the proposed location is along Owego Road near the Vestal Parkway, a residential area. Inflection Executive Vice President Scott Zimmerman showed up - 30 minutes late - to represent the company, though there was some uncertainty about whether he could officially represent the parent company, MegaEnergy. And, according to comments from those who attended, he stood with his back to the public and mumbled his way through the presentation. Residents had great difficulty both hearing and understanding what he was saying. Inflection hopes to run a pipeline to the proposed station from gas wells the company plans to drill once the state begins permitting high-volume horizontal fracking in the Marcellus shale. The gas will be pressurized at the station and then sold to NYSEG. 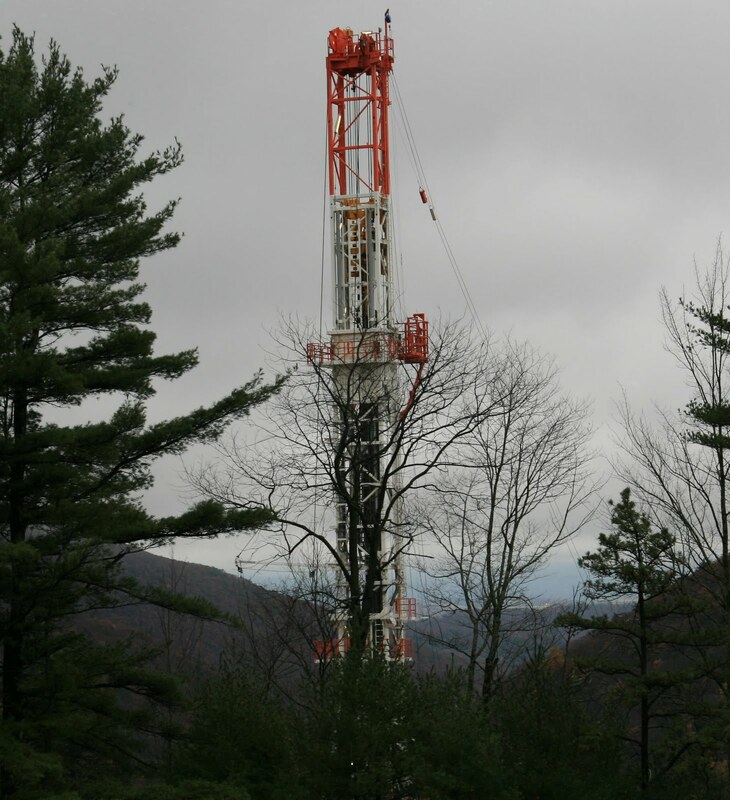 Inflection has already acquired drilling rights to about 800 acres near the Owego Road site and, according to Zimmerman, they've already drilled a vertical test well. Although the meeting was originally scheduled to last 20 minutes, the zoning board remained for nearly 3 hours allowing citizens an opportunity to voice their concerns about noise, traffic, potential accidents and aesthetic issues related to the proposed project. At the end of the meeting the board proposed that Inflection move the facility further back on the property and up a hill near near a town water tank. The currently proposed site is situated in the midst of houses. But, said one person after the meeting, Zimmerman would not compromise. Read more about the meeting here, and about the company's proposal to lease county land for drilling here and here. 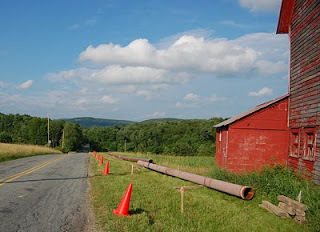 Remember the little town of Dimock in Susquehanna County, Pennsylvania? The place where, on January 1, 2009 residents lost their drinking water because of an explosion due to drilling? It's been 19 months and they still don't have their water - but they are getting closer. Today, he PA Department of Environmental Protection (DEP) gave Cabot Oil & Gas Corp. an extension - they have 60 days to permanently fix the water supplies that were affected by the company’s natural gas drilling operations in Dimock. According to DEP the directive is part of a modified consent order and agreement that requires Cabot to continue providing temporary water services until the permanent solution can be implemented. The additional 60-days comes as a result of homeowner dissatisfaction over Cabot's previous proposal to fix the water contamination issue. Back in April , DEP and Cabot entered into a modification of the original consent order and agreement that was executed in November 2009. One of the provisions required whole-house water treatment systems to be installed in 14 homes as a permanent water supply resolution. But several residents didn't like the whole-house treatment systems. Due to the resident reaction, Cabot requested an extension of the consent order and agreement time frame to install a permanent solution. DEP agreed to delay enforcement of that provision to allow for additional discussions with residents. Also in April, DEP suspended its review of Cabot’s pending permit applications for new drilling activities statewide until the company fulfilled its obligations to plug and repair the wells that caused the gas migration, which caused the water contamination. In accordance with that agreement, Cabot has plugged three gas wells and has made repairs to another well. As a result, DEP will resume reviewing Cabot applications only for permits to drill gas wells outside of the affected area in Dimock Township. Read the original DEP press release here. Arcuri to Industry: No More Exemptions! NY Congressman Michael Arcuri has teamed up with Maurice Hinchey in an attempt to force the natural gas industry to clean up it's act - and in the process, play by the same environmental rules as all other industries.He's starting small - just asking that oil and gas drillers abide by the same storm water runoff regulations as every other industry. On July 1 he offered an amendment that strips that exemption during the House Committee on Transportation and Infrastructure’s consideration of the Oil Spill Accountability and Environmental Protection Act of 2010 (HR 5629). Arcuri’s amendment would help protect surface water from drilling site runoff contamination by removing the special exemption from the Environmental Protection Agency’s (EPA) storm water permit requirements through the Clean Water Act. A farmer has to get a storm water permit when he’s putting up a new barn, Arcuri said. So does a homebuilder developing a new subdivision. But oil and gas drillers get a free ride when constructing their well pads. “It’s about holding oil and gas to the same environmental standards as we hold every other industry,” Arcuri said. Before 2005, EPA began issuing storm water regulations for the construction of oil and gas drilling sites. However, the Energy Policy Act of 2005 halted that process. That bill allows the oil and gas industries numerous exemptions, among them a permanent exemption for all construction activities related to oil and gas exploration and production. That doesn’t make sense. “By allowing oil and gas drillers to construct their well pads and access roads with out permits, we assume they’ll take the necessary precautions to prevent storm water runoff,” Arcuri said. Erosion precautions aren’t extravagant – straw bale barriers and silt fences can prevent storm water from carrying pollutants into rivers and streams. Preventing pollution is a lot cheaper than paying for the clean-up, Arcuri noted. Development of natural gas in Upstate New York has the potential to bring tremendous economic benefit to the region, Arcuri said, but he is concerned that "fast-tracking" may lead to more incidents the BP oil spill. But what troubles Arcuri more than “fast-tracking” is the realization that most gas wells in this area will be drilled on agricultural and forested land. The rate of sediment runoff on construction sites is 10 to 20 times higher than on agricultural land and It’s 1000 to 2000 times greater than on forested land. 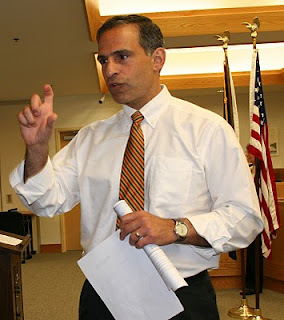 “If we continue to exempt the oil and gas industry – which is already constructing wells all across the watershed – from permitting requirements for storm water discharges, it will place even greater burden on our farms, taxpayers and water system rate payers,” Arcuri said. And that’s particularly unfair to local farmers who are doing their sediment control right, he added. Despite heated debate the committee passed Arcuri's amendment with bipartisan support. Now, Arcuri says, the “Oil Spill Accountability and Environmental Protection Act of 2010” heads to the House floor where he expects tough opposition. Arcuri says he’s ready for a fight. Furthermore, he’s already thinking about the next piece of legislation that will strip away some of the other special exemptions the oil and gas industry enjoy. “If we can’t do it in a single FRAC Act, we’ll make it happen piece by piece,” Arcuri said. 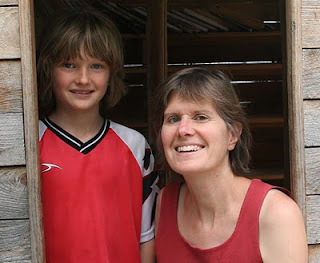 Google "Sandra Steingraber" and you'll learn that she is an ecologist, author, cancer survivor. An inter-nationally recognized authority on environmental links to cancer and other health problems, Steingraber is currently a scholar-in-residence at Ithaca College. She is also the author of the highly acclaimed book, Living Downstream, which was recently made into a movie. But when we settle onto the grass near the bridge in Trumansburg it becomes immediately clear that Steingraber sees her most important role as a parent whose responsibility it is to keep her children safe from harm. As Steingraber keeps one eye on her eight-year old son, Elijah, she talks about her recent trip to Washington DC. She was one of three participants in a congressional staff briefing that focused on the President's Cancer Panel report, “Reducing Environmental Cancer Risk” released in early May. There is a disconnect between scientific evidence and regulatory response, Steingraber says. The Toxic Substances Control Act (TSCA), for example, regulates the introduction of new or already existing chemicals. But it grandfathered in most existing chemicals and, says Steingraber, “It is so weak that it couldn’t even ban asbestos. Even US industries recognize they are losing market share in the European Union because of this law," she says. The reason? The European Union embraces a precautionary approach to regulating industrial pollutants. In contrast, the US takes a reactionary approach in regulating chemicals, forcing citizens to bear the burden of proving a chemical causes harm. “Stronger regulation is needed,” Steingraber says, echoing words scribed by the President’s Cancer Panel. Industry is, and has been for years, exploiting regulatory weaknesses at a high cost to the nation - $243 billion just from cancers alone, from one single year (2009). Steingraber points to a recent study in West Virginia; it shows that the entire economic benefit to the state from the coal industry is wiped out by the mortality and lost productivity of sick coal miners. “Cancer is not cheap.” Steingraber speaks from experience. “Forget about having a retirement fund or money in the bank.” Individuals aren’t covering all the bills, she says - it's taxpayers who underwrite the cost of environmental pollution. "And that has direct implications for high-volume hydraulic fracturing," Steingraber says. "Fracking means deliberately introducing carcinogens into our land, water and air." Even if there’s not a single chemical spill there will still be problems: diesel exhaust from trucks, emissions from compressors at the well site, emissions from compressor stations and leaks in pipelines. “Then you have the chemicals themselves.” Steingraber cited the recent revelation of 981 gas and oil spills in Colorado. Frack fluid, combined with produced water (brine) accounted for more than 80 percent of the 5.2 million gallons spilled. “Spills seem to routinely accompany the process,” Steingraber said. “Maybe we can clean up surface spills. But shattered bedrock – there’s no fixing that.” She looks up at her son. “Industry shouldn’t introduce technologies where, in the worst case scenario there’s nothing to be done.” Reflecting on the BP spill she says, "We go deeper into the ocean, with catastrophic results. We remove mountaintops for coal, with catastrophic results. Now we’re fracking for gas ... with catastrophic results. How far are we willing to go to get this energy?" If we fully factored in the true environmental costs of fracking, Steingraber pointed out, it would mean counting the diesel fumes from trucks hauling water and chemical to the site, and frack fluid and well waste from the site. It would mean factoring in the run-off and erosion from drilling pads and access roads, chemical spills and wear and tear on local roads and infrastructure. You can read Steingraber's blogs and articles on her website. You can read the President's Cancer Panel report here. An independent investigation reveals that untrained personnel and the failure to use proper well control procedures were the principal causes of the June 3 natural gas well blowout in Clearfield County. The PA Department of Environmental Protection (DEP) released the report today. According to DEP Secretary John Hanger, the blowout - which allowed natural gas and wastewater to escape from the well for 16 hours before being brought under control - happened when the well’s operator, EOG Resources, and its contractor, C.C. Forbes LLC, lost control of the well while performing post-fracturing well cleanout activities. 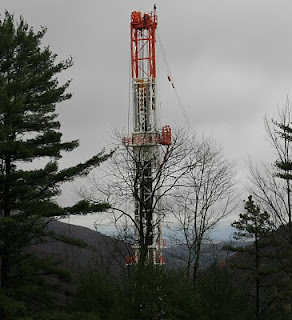 “The blowout in Clearfield County was caused by EOG Resources and its failure to have proper barriers in place. This incident was preventable and should never have occurred,” said Hanger. He then ordered EOG Resources to take nine corrective actions, and C.C. Forbes to take six corrective actions, and fined both companies - EOG will pay $353,400 and CC Forbes $46,600. Read entire DEP release here. Landowners looking to lease gas rights for drilling are advised by their lawyers to lease pipeline rights separately. But, if energy corporations have their way, they might be able to simply take people's land through eminent domain and dispense with shelling out the cash. It's only been 20 months since the guys from Oklahoma and Texas came through with the Millennium Pipeline. Finally the vegetation is beginning to cover the scars on our hills - and now another pipeline company wants to carve a 50-foot wide swath across the farms and forests from northern Pennsylvania through Windsor and southern Broome County, NY to connect with the Millennium pipeline. Laser Northeast Gathering Company, formerly Laser Midstream, filed a request in January to become a public utility. If the request is approved, Laser would be allowed to obtain land for a proposed natural gas pipeline through eminent domain. The folks at yesterday's hearing weren't enthralled with the idea of allowing a private corporation the power to take their land so they can make a profit. You can read the article here. The idea of allowing private profit-driven corporations the power of eminent domain just doesn't sit right with me - and hasn't since the Kelo vs. New London. Photos provided by Kelly Finan. 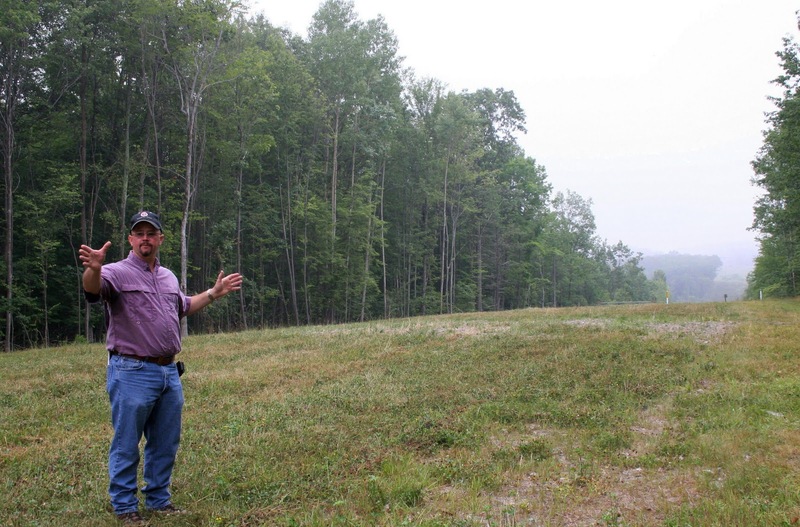 Six months ago, when Chief Oil & Gas approached landowners in Hop Bottom, PA about leasing land for a gathering pipeline, a number of residents weren't interested. Long-time resident Linda Lewis was adamant that she didn't want gas drilling on her land - and she certainly didn't want pipelines running through her land. Neither did her neighbor, Lynn Butler. Now Chief Oil & Gas has set out lines of bright orange plastic cones along State Route 2002, pounded stakes flagged with neon surveyor’s tape, and laid out a line of 12-inch pipeline sections along the side of the road. This gathering line will transport the gas produced at three wells to a compressor station. Before it gets to that compressor station, the gas will travel across Lewis's front yard and within feet of Butler's barn. And that's got both women, and a bunch of neighbors, pretty riled. Why couldn't they run the pipeline beneath the abandoned field across the road from her, Lewis wonders. "Nobody lives there; it's been empty for the last 40 years." She says she's called Chief Oil & Gas numerous times, but they still have yet to return her calls. Now Lewis wonders how – and whether – she can prevent the gas drilling company from installing what she sees as a potential explosion hazard so close to her home. She also wonders how Pennsylvania Department of Transportation (PennDOT) can so cavalierly give away rights to put in a pipeline on what she clearly thinks is her land. 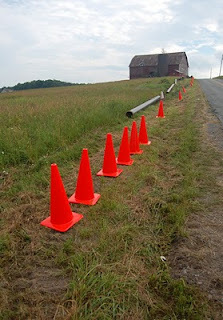 PennDOT feels they are simply doing their job. The state owns the right of way, says spokes-person Karen Dussinger, explaining that right-of-ways may extend anywhere from 25 feet to 50 feet or more from the center of the road. The state allows DOT use of the right-of-way through an easement. PennDOT, in turn, permits certain utilities – gas, water, sewer, aerials, communication and power companies – to use the land beside the state highways. "We cannot deny anybody access as long as they meet our permit requirements," Dussinger said. Lewis and her neighbors wonder whether Chief Oil & Gas actually meets those permit requirements. According to Robert Kretschmer, one of the permit managers at PennDOT, Pennsylvania Code, Chapter 459 provides regulatory guidance on issuing those permits. Its title is “Occupancy of Highways by Utilities” – and that’s the very question Hop Bottom residents are asking DOT: is a drilling company putting in a gathering line considered a utility? This is not a trivial question, because utilities may obtain property through eminent domain – something pipeline companies in Texas have been using for a number of years. But at least eminent domain would mean being reimbursed for the use of your land. It would also mean public hearings – and an opportunity to challenge the proposed pipeline. Lewis and her neighbors had no opportunity to challenge Chief’s pipeline plans. There was never any public conversation about the project. “That’s because public hearings and notification of property owners along the right-of-way are not required,” Kretschmer said. PennDOT accepts Chief's status as a utility because they ultimately serve the public, no matter that the neighbors see it serving the corporation. Dussinger adds that if the facility in any way directly or indirectly results in service to the public or any part thereof, the "serving the public" requirement is met. The facility distributes gas to their plants for removal of impurities and then is delivered directly to homes or businesses through local distribution lines. And that, says PennDOT, indirectly results in service to the public. note: comments from Dussinger and Kretschmer come from telephone conversations in the course of investigating this issue. 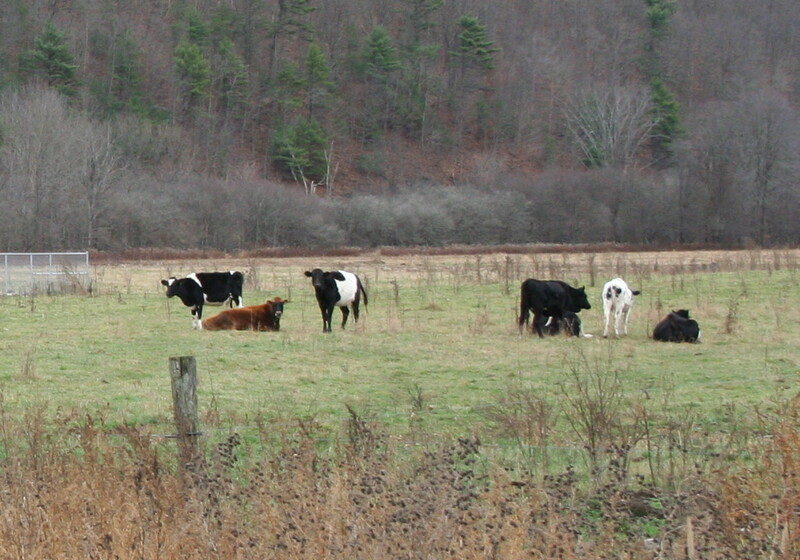 The Pennsylvania Department of Agriculture quarantined 28 cows on a Tioga County farm after they came into contact with drilling wastewater from a nearby natural gas operation. The cows were out to pasture when a holding pond that was collecting frack flowback leaked. The leaky frack pit is on a well pad being drilled by East Resources Inc. The frack leak killed grass in a 30- x 40-foot area where the wastewater had pooled, and the wet area extended about 200-300 feet into the pasture. The cattle had potential access to the pool for three days or more before the gas company fenced off the area. Tests of the wastewater showed that chloride, iron, sulfate, barium, magnesium, manganese, potassium, sodium, strontium and calcium were present. The main element of concern, according to Redding, is the heavy metal strontium - it can be toxic to humans, especially growing children. Strontium takes a long time to pass through an animal’s system because it is preferentially deposited in bone and released in the body at varying rates. On Saturday, June 26 at 5:30 am some residents of Owego, NY were woken up by a loud noise that sounded like a train disengaging rail cars. Then the power went off. The cause? The driver of a flatbed tractor trailer owned by 5J Oilfield Services (out of Palestine, TX) was driving Route 17C through town too fast, lost control of his rig and sheared off several telephone poles and a guardrail while trying to negotiate a gentle turn in the road. 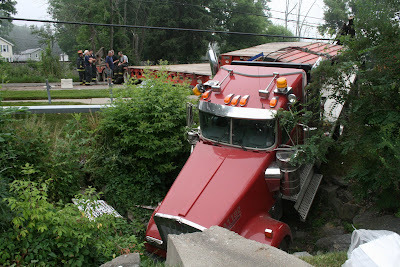 The cab of his truck ended up in the stormwater drainage ditch in front of a local family practice clinic. When police arrived at the accident scene, the driver was no where to be found. My colleague, Wendy Post received a call about the accident and ran down to take photos. She was so intrigued by the missing driver (found later) that she followed the story throughout the day. You can read more about it and see her photos here. Back in March the Pennsylvania State Police reported on overweight trucks traveling Bradford County (PA) roads.One tractor trailer, driven for 5J Oilfield Services was clearly in violation of its permit, weighing in at nearly 53,000 pounds over the limit. The driver was fined more than $16,000 and released. Less than 24 hours later, police stopped two more trucks from the same company at that same location after people called in traffic complaints. Both trucks were oversize and overweight. The drivers were fined more than $10,000 and released. If you want to find out anything about Schlumberger, a company located in Horseheads, NY that will be trucking chemicals and gas-field supplies to drill sites located in NY, PA the surrounding area, you can read all about them on their website. They provide a lot of info. But if you wanna find out about 5J Oilfield Services you get this, a page "under construction". No website, lotsa violations, and an LLC to boot. Makes you wonder exactly what the gas industry means when they say they have everything under control.